Favorite Quote: I, Tiberius Claudius Drusus Nero Germanicus This- that- and- the- other (for I shall not trouble you yet with all my titles) who was once, and not so long ago either, known to my friends and relatives and associates as "Claudius the Idiot", or "That Claudius", or "Claudius the Stammerer", or "Clau-Clau-Claudius" or at best as "Poor Uncle Claudius", am now about to write this strange history of my life; starting from my earliest childhood and continuing year by year until I reach the fateful point of change where, some eight years ago, at the age of fifty-one, I suddenly found myself caught in what I may call the "golden predicament" from which I have never since become disentangled. Tiberius Claudius Drusus Nero Germanicus lived from 10 B.C. to 54 A.D. Despised as a weakling and dismissed as an idiot because of his physical infirmities, Claudius survived the intrigues and poisonings that marked the reigns of Augustus, Tiberius and the mad Caligula to become Emperor of Rome in 41 A.D. 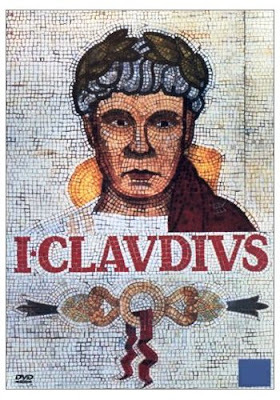 I, Claudius, the first part of Robert Graves' two- part account of the life of Tiberius Cladius, is written in the form of Claudius's autobiography and it stands as one of the modern classics of historical fiction. From the first sentence (quoted above), this book really pulls you in. It's full of political corruption, military acumen and potent, witty observations on Roman society as it began its slow decline. I had no idea that assassination was such a viable form of getting rid of your enemies (or potential enemies. Or friends of potential enemies. Or possible friends of potential enemies) back in Rome, but clearly, I have been viewing Rome through rose-tinted, Falco-induced glasses. Now I see that it was a cesspool of blatant corruption and vindication! This has come up a few times on my Amazon recommendations. I haven't read much on ancient Rome but do have in interest in doing so at some point. This one sounds interesting -I'll add it to my list!